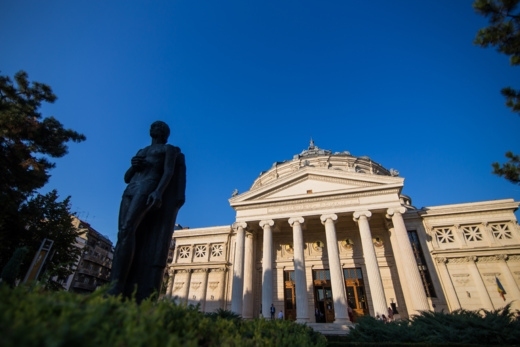 Romanian Athenaeum will host one of the most important conducting competitions in the world. The competition (http://www.bucharestcompetition.ro) is open to all young conductors from all over the world and is an important professional and networking platform. Known nationally and internationally for its continuous promotion of high professional standards and excellence, the competition brings to Bucharest some of the most talented conductors in the world. Last year over 200 conductors applied and only 50 were selected to participate in the first round. This year, the competition will take place in from the 26th to the 30th of September, 2017, in Bucharest at the Romanian Athenaeum – the most important cultural landmark of the country. The conductors who will be accepted in the first round will have the opportunity to work with some of the most important contemporary artists in the classical music field. The official orchestra of the competition is the world-renowned George Enescu Philharmonic Orchestra, a historical musical institution which has dazzled audiences from every continent. Octavian Lup, last year’s finalist at the George Enescu International Competition will also be working with the competitors. The contestants will be judged by a jury composed of some of the most remarkable contemporary conductors: Sigmund Thorp, who will be President of the jury, Christian Ehwald, Jacek Rogala, Horia Andreescu, Gheorghe Costin, Vasila Cazan, Cristian Orosanu, Marta Wierzbieniec, and Bujor Prelipcean. In order to mark the 8th edition of the festival, one of the greatest contemporary Romanian composers, Dan Dediu, has composed a musical piece specifically for the festival. The competition will end on September 30th with a Gala Concert in the Grand Hall of the Athenaeum. Three finalists will conduct the George Enescu Philharmonic Orchestra in front of 800 people. The concert will be aired live on the competition’s website; last year’s gala drew in 15.000 viewers from all over the world. In addition to the financial prizes, the competitors will also receive conducting committees with the Philharmonic Orchestras of Craiova, Timisoara, Sibiu, Iasi, Brasov, Kielce (Poland), The National Chamber Orchestra of Moldova, the Târgu Mureş State Philharmonic, the George Enescu Philharmonic Orchestra or the Orchestre Philharmonique Royal de Liege (Belgium). The conductors who have participated in previous editions have enjoyed international mobility opportunities which have helped their professional development. Kah Chun Wong (Singapore) won the 2013 edition and in 2016 he won the Gustav Mahler Competition. He was invited two times in Bucharest by the “George Enescu” Philharmonic Orchestra and this year he will open its 2017-2018 season. Among previous winners and participants who have enjoyed success we can recall Haoran Li (China), Sergey Simakov (Russia), Johnatan Mann (Great Britain) and Simon Proust (France). The project is co-financed by the Administration of the National Cultural Fund. For more information please contact concurs@bucharestcompetition.ro.